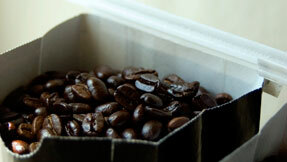 Different varieties of beans differ in moisture and density and therefore roast at different rates. It is up to the roastmaster to test, taste and subsequently deliver different varieties of beans to their appropriate roasted temperature and color. Every bean has their optimum roast to bring out the complexity of flavors that live in the gasses and oils after roasting. Lighter roasts contain more caffeine, acids and oils, and may have a subtle, yet pleasurable bitter quality. Darker roasts lose their oils faster (and are more visible on the outside of the bean), but have a sweeter flavor and less acidity. Whether you prefer a single origin coffee or a blend, we roast beans to take advantage of each bean's best qualities.